Maria's Mexican Restaurant, 5234 South Blvd., 704-525-5075. Hours: Daily 11 a.m. until 9 p.m. Menu served all day. Major credit cards. Karaoke on weekends. I'm not sure why there is so much discussion about where to find "good" Mexican food in Charlotte. We don't have Portuguese bakeries or entire sections of town devoted to Italian cuisine as does San Francisco and Boston. Nor do we have a Chinatown. But Mexican cuisine? We've got that. When the 2010 federal census is completed we will have updated statistics, but for now North Carolina has the fastest growing Latino population of any state, and the majority of these residents are from Mexico. In fact, of Charlotte's three largest ethnic groups -- Mexican, Indian and Vietnamese -- immigrants from Mexico represent the largest population. Just take a drive down South Boulevard, Central Avenue, Tryon Street or Albemarle Road, and the vast offerings of the various types of Mexican cuisine is apparent. Mexican cuisine encompasses a range of dishes and presentations from loncheras (or taco trucks), to high-end, chef-driven restaurants. But most of the places featuring Mexican cuisine in Charlotte are along the lines of fast-casual. In Mexico, high-end restaurants were once the province reserved for French and Spanish cuisines. Until the Spanish showed up, Mexican food wasn't fried, and until Rick Bayless showed up, much of what Americans thought was Mexican was actually quasi-Mexican. Of the Mexican cuisines that have become popular in the United States during the past 50 years, TexMex and CalMex are the most popular. TexMex features dishes such as Chili con carne, chimichangas, nachos (thought to have been created at a Dallas state fair), and the fajita. TexMex plates ooze with tomato sauce, cheddar cheese and sour cream. CalMex, on the other hand, is known for burritos and tacos. These are the large burritos with a rice-and-bean base, while the tacos feature such ingredients as beer-battered cod, as in a fish taco -- which originated in San Diego. In Charlotte, Mexican cuisine, much less a down-home taqueria serving a taco al pastor, was hard to come by 25 years ago. That was when El Cancun opened and subsequently dotted the city and the surrounding area with its eateries. Last June, restaurateur Maria Sorto bought the EL Cancun location on South Boulevard and rebranded it as Maria's Mexican Restaurant. Sorto is a native EL Salvadorian who has worked in Mexican restaurants in the Charlotte area -- Azteca, Los Reyes, and El Cancun -- since 1997. This is her first restaurant. The décor at Maria's still looks the same, in a building originally designed to be an Arthur Treacher's Fish and Chips franchise from the 1980s, with its distinctive lamppost sign -- there, but covered with the new owner's information. The feel is still fast food, though. Maria's crowd is distinctly American. The only people speaking Spanish are the servers who happily switch between the two languages. A few tables hold young families, others couples, another Charlotte's finest. The carefully scripted menu of the usual suspects with lengthy English descriptions and a few pictures is a roundup of 25 years of learning what Charlotteans want in Mexican food. Sorto has added three Salvadorian items, including a parrillada and a seafood soup and said she would have added more if so many Salvadorian restaurants had not been established nearby on South Boulevard. Here are quesadillas, nachos, burritos, and chimichangas and more. Hot yellow corn chips and a pureed salsa -- in mild and hot -- are constantly refilled. The sizzling chicken fajita is fine as fajitas go, as were the thinly cut beef with slices of avocadoes and tomatoes on the Carne Asada. I've tasted more opulent forms of white cheese quesadillas, but this small rendition is perfunctory. 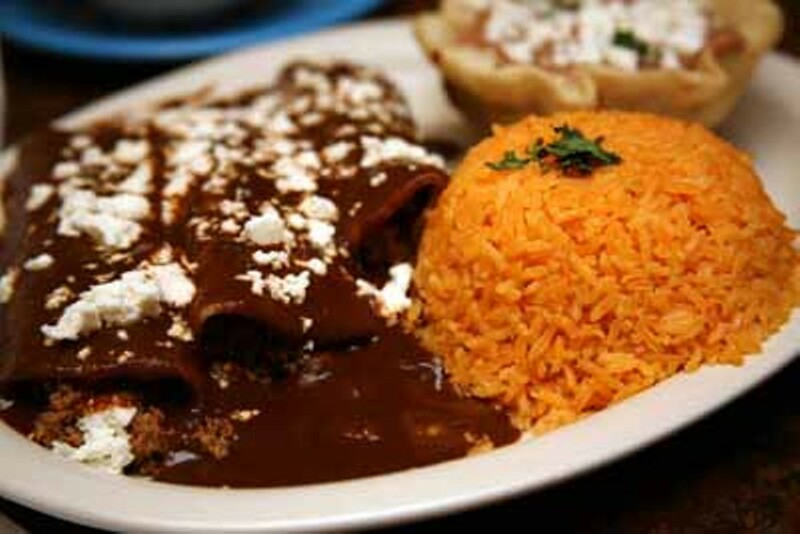 Best of all, though, was the mole on the chicken enchiladas (enchiladas rancheras) wrapped in corn tortillas. At Maria's, the side dishes -- beans, rice, iceberg salad -- fill all the available spaces on the plate. With Maria's pleasant neighborly scale, the food is perhaps better than you might expect but with the prices, it's probably not as good as it could be. Some of the dishes run to $17.99; however, of the 28 special entrees, 19 are under $8. On the beer roster are the ones you would expect and want: Corona, Tecate, Dos Equis, Negra Modelo, Carta Blaca, and the popular Bohemia. Margaritas, in non-alcoholic form as well, are offered in three sizes ranging from $4 to a top shelf large at $10.35. Desserts are decorated with whipped cream and maraschino cherries, producing dishes that are more celebratory than tasteful. The rustic flan was not as creamy as it was supposed to be, and the fried ice cream is a dish far more ubiquitous in Charlotte than in the cities or countryside of Mexico. Get the latest local food news, interviews, recipes and more at our new food blog Eat My Charlotte: www.eatmycharlotte.com.